With doctor visits, baby showers, swelling, stress, joy, and a growing belly that come with pregnancy, it’s easy to forget to prepare yourself spiritually to welcome your newborn little baby into the world. That’s why Éline Landon crafted maternal reflections and Scripture passages. Her new book helps Catholic moms prayerfully live each month of pregnancy according to God’s loving plan. As the birth of your child approaches, turn to these loving pages to refresh your soul, strengthen your faith, and gain inspiration from the example set by the many expectant couples in Scripture. Here are nine passages of Scripture to reflect on during each month of pregnancy! 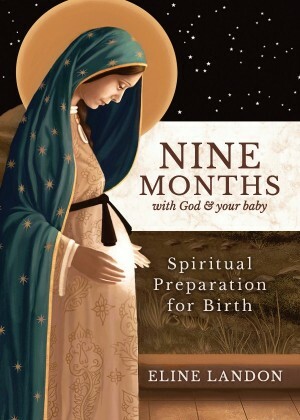 For the full beauty of spiritually preparing for birth, pick up a copy of Nine Months with God and Your Baby by Éline Landon from your local Catholic bookstore or online through Sophia Institute Press. “Lo, sons are a heritage from the Lord, the fruits of the womb a reward,” the psalmist writes. “You formed my inmost being; you knit me together in my mother’s womb. I praise you, because I am wonderfully made; wonderful are your works! My very self you know,” the psalmist writes. This is the perfect psalm to meditate on during the second month of pregnancy! “Fear not, for I am with you; I will bring your offspring from the east, and from the west I will gather you; I will say to the north, Give up, and to the south, Do not withhold; bring my sons from afar and my daughters from the end of the earth, every one who is called by my name, whom I created for my glory, whom I formed and made,” Isaiah writes. By the third month of pregnancy, mothers may question themselves. Will they be capable of loving their children? How will they provide? “Amen, I say to you, unless you turn and become like children, you will not enter the kingdom of heaven. Whoever humbles himself like this child is the greatest in the kingdom of heaven. And whoever receives one child in my name receives me,” Christ says in Matthew’s gospel account. Even as mothers observe a child growing in the womb in the fourth month of pregnancy, they are also called to become childlike in their relationship with the Lord. “My soul proclaims the greatness of the Lord; my spirit rejoices in God my savior. For he has looked upon his handmaid’s lowliness; behold, from now on will all ages call me blessed,” Mary proclaims in Luke’s gospel. Just like John the Baptist jumped for joy in Elizabeth’s womb, babies experience important events in the womb. The Visitation is the perfect meditation for the fifth month of pregnancy! “As for Sarai your wife, you shall not call her Sarai, but Sarah shall be her name. I will bless her, and moreover I will give you a son by her,” the Lord tells Abraham in Genesis. By the sixth month of pregnancy, parents may have a list of names they’re contemplating giving their child. Names are important, both in Scripture and in the lives of our children. “Suddenly a violent storm came up on the sea, so that the boat was being swamped by waves; but Jesus was asleep. They came and woke him, saying, ‘Lord, save us! We are perishing!’ He said to them, ‘Why are you terrified, O you of little faith?’ Then he got up, rebuked the winds and the sea, and there was great calm,” Matthew writes in his gospel. The seventh month of pregnancy ushers in a season of preparation. It can be easy to get swept away in preparing for the arrival of a baby, and worried about the pain that could come with labor. “When I am weak, then I am strong,” Saint Paul writes in his second letter to the Corinthians. The eighth month is the perfect time for a reflection on weakness and vulnerability. “The birth of a child exposes us, in the literal as well as the figurative sense of the word. We do not give birth with our clothes on, right? Likewise, we must remove all the skins that we have put on to protect ourselves, like armor,” Landon encourages expecting mothers. “But I have calmed and quieted my soul, like a child quieted at its mother’s breast; like a child that is quieted is my soul,” the psalmist writes. The last month of pregnancy may seem to stretch on for much more than four weeks, but it provides a beautiful time to make the last spiritual preparations before birth. Nine Months with God and Your Baby by Éline Landon makes the perfect baby shower gift for the new Catholic mom in your life. Pick up a copy today!